NOTE: PLEASE DO NOT USE BOOK NOW Button! Look to the right and click on "Ask Owner a Question" Let's start a conversation and make sure that our house is a good fit and that you get all the available DISCOUNTS or SPECIALS. Our home contains all high end furnishings, beds, decorations, appliances, cookware, sheets, and towels. We have meticulously provided you with every comfort of home. And, if we don’t have it, just ask, and we will provide! The house is in a quiet, private neighborhood with parking for 2 in the garage, 3 in the driveway, and unlimited in the street. 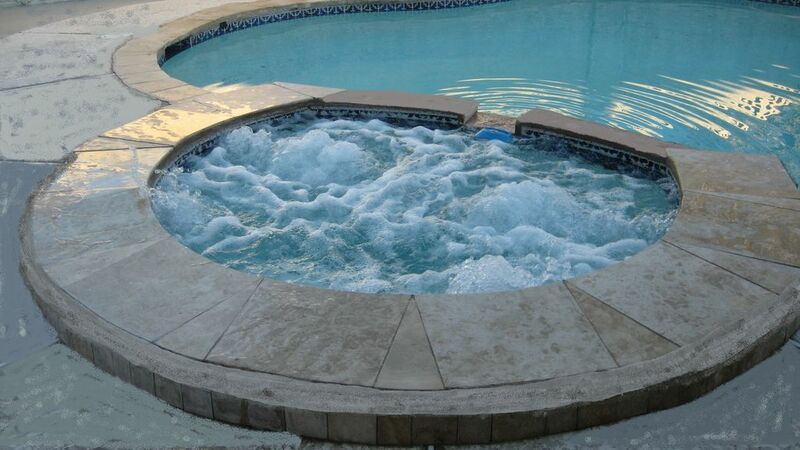 Enjoy the sparkling pool and bubbly spa in a completely enclosed PRIVATE back yard with BBQ. Spa heating is always included. The house has four bedrooms, large master chef kitchen, full dining room, game room with poker table, family room, and 3 bathrooms. The master bedroom has a California King size bed, an en-suite spa bathroom, comfy chair, and 3 large custom closets. The master bath has two sinks and a stand-up spa shower with soft rain downspout surrounded by Calcutta Luna marble. The second and third bedrooms have luxurious queen size beds, and the fourth bedroom has 2 twin beds and includes a TV. This is comfortable sleeping for 8. Single foldout beds can be used to increase sleeping accommodations to 12. The family room has two large plush couches and a comfy chair centered about the incredible glass fireplace and 55 inch TV. The poker table and 1000 clay chips are perfect for your in house Texas Hold-em tournament and can be flipped over for other uses. The back yard has a hot tub and pool. They are heated on demand. ... Also a Weber Summit 6 burner Gas Grill. There are four golf courses less than 5 miles away: TPC Summerlin, TPC Las Vegas, Badlands Golf Club, Canyon Gate Country Club, and Angel Park Golf Club. We are walking distance to the SunCoast and Rampart Casinos (15 min) and a short 4.4 mile trip to the most popular off strip Red Rock Casino! Also, there are many bars and restaurants that are just a 10-20 minute walk away or an easy drive. Tivoli Village is a short 1 mile walk and includes shopping, dining, and a cigar bar. There is a great exercise circuit surrounding the Angel Park Golf course that is just a 10 minute walk. The house is located 1500 feet from the Westcliff Transit Center which is a public transit option for travel to Historic Downtown, the Las Vegas Strip, and McCarran International Airport, among other destinations making a rental car not mandatory! Mark and Myrla Baumann from La Mirada California. We are both professionals working in Southern California and playing in Las Vegas. We wanted a Vacation home in Las Vegas on the east side because of the easy access to Red Rock Canyon, golf courses, and great off strip casinos. Summerlin also offers just about any popular restaurant or shop we have ever heard of. We request that you do not eat or sleep on the living room couches and chair. Thank you. Keurig K-cups, some K-cups are provided, renter is encouraged to purchase more from the store. Also has regular Drip Coffee machine. Cooking sheets, platters, dishtowels, place mats, cutting boards, storage containers, baggies, foil, stretch wrap, napkins, dishes, cookware, utensils. Paper plates and cups are recommended for meals for large groups. All new appliances, dishes, cookware, utensils. Dining room seats 6, Center Island seats 3, Game Table converts to dining table and seats 4. Poker table and chips ChromeBox computer, LCD screen, Keyboard, Mouse, speaker. Four courses within 5 miles. House was clean and updated. We had plenty of room. The only downside was the TV options--having cable would have been nice. Otherwise the house was perfect for our stay. Thank you for the review. We strive to keep our home in great shape and to keep our rates low. We have ROKU TV which offers unlimited streaming... with thousands of free channels and most premium channels offer 2 week free auditions that takes minutes to subscribe, just cancel before heading our of town. Plus, you can sign in to your own Netflix, Amazon Prime, Hulu, etc. accounts. You can also bring your own Apple TV, Amazon Fire, or other streaming box and attach it to any of the TVs. Our High Speed WiFi is the best available. We also provide more than 80 local stations, many in high definition. Nice home in a convenient location. The house is well maintained and provided the perfect get away for us while our A/C unit was repaired. The owners communicated well and everything they said was true. I would use this house again if we need a place to stay or if we have guests coming to Las Vegas. The House was perfect. The pool and hot tub was amazing. Definitely going to have book again. Everyone was beyond impressed with the rental house. We can’t wait to go again. Vincent, with friends and family were exceptional guests. The house was perfectly cared for. They are welcome back anytime. The house was great and the owner was very nice. Great communication, thank you! We just spent Christmas at this beautiful home. We arrived to find treats, a few darling decorations (even outside icicle lights), and a beautiful Christmas candle. These were unexpected and thoughtful gestures that started our holiday off perfectly. The house had everything we needed and then some. We loved the fireplace, the hot tub, the kitchen and everyone ended up using the master shower at least once because it was so gorgeous. There was easy access to the freeway and plenty of things to do close to home in addition to our time at Hoover Dam and The Strip. Each night we were eager to return back to this house, however. We all unanimously agreed it was an amazing home we would highly recommend! This was a great place for my family to stay on our recent trip to Las Vegas. We had three little boys (six months to six years old), mom and dad, grandpa and grandma, and Morgan the dog. The boys really enjoyed the pool. Mom and dad enjoyed being close to golf and the Strip. Grandpa and grandma thought the kitchen was great (best equipped and stocked of any vacation home we've stayed at). Morgan the dog was just happy that he could stay with us. The manager was great to work with, was available and answered all questions. We would definitely try to stay here again if we come back to Las Vegas. Matt and his family were great guests. The respected our home, followed all rules, and left it in very good shape. Highly recommended to other hosts. Summerlin is an affluent master-planned community under development by The Howard Hughes Corporation in the Las Vegas Valley of Nevada near the Spring Mountains and Red Rock Canyon National Conservation Area. It lies within the city of Las Vegas, Nevada, and in unincorporated Clark County. Summerlin is named for Howard Hughes’ grandmother, Jean Amelia Summerlin. The community includes a variety of land uses, including: residential, commercial, recreational, educational, medical, open space, and cultural. With an average household income of $128,000, Summerlin is among the most affluent communities in Nevada. In 2014, Summerlin was named one of the 'Best Places to Live in America' by Money.